Nationally recognized pastry chef Joanne Chang ’91 returned to Harvard as part of the Science and Cooking Lecture Series. The series combines a love of delicious food with an equal appreciation for science. Each lecture begins with a brief introduction on the relevant scientific terminology and equations. While informative, these introductions only build anticipation for the main event. During her years at Harvard, Chang concentrated in Applied Mathematics and Economics. However, she enjoyed baking in much of her spare time. After working as a consultant for a few years, she quit her job and pursued this true passion. Since that time, she has opened numerous Flour Bakeries and Myers + Chang, proving herself as an incredible baker and accomplished businesswoman. By returning to Harvard, she introduces the relevance and applications of science in the world of gourmet cuisine. 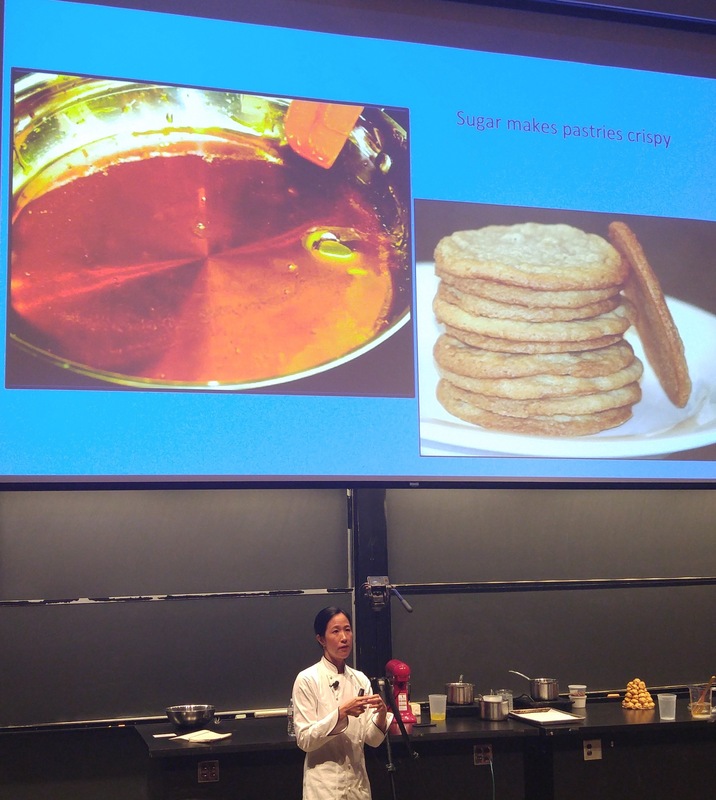 Chang’s lecture on September 21 was titled “The Science of Sugar” because of Chang’s expertise as a baker and pastry chef at some of the best United States restaurants. We are introduced to sugar as a malleable tool that accomplishes many incredible tasks in cooking. Creaming: The process of mixing sugar and butter is a process known as creaming, which is essential to several aspects of baking. 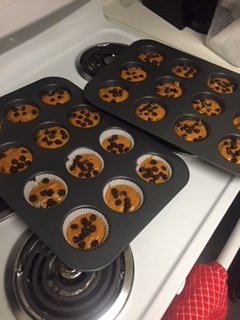 Cookies, cakes, frosting, and the like depend on creaming to incorporate additional air into the good. Hydroscopicity: Sugar is incredible at absorbing water, which allows it to preserve food and make it last significantly longer. This is essential to many commercial goods and allows them to stored and marketed for large periods of time. Lowering freezing point: For many frozen goods (ice cream, sorbets, even frozen yogurt), sugar lowers the freezing point, which can make for a much more palatable product. Sugar, in high enough quantities, prevents the crystallization of water and allows for a smoother product. Stabilizes egg foams: While enjoying that mousse, soufflé, or meringue, the egg foams did not just stand up on their own. Sugar is crucial in the process of ensuring that the proteins in the egg foams do not collapse. Aids in browning: Enjoy the lovely browned cake or cookie? Sugar is responsible for this as it caramelizes on the surface of these goods. Tenderizes and inhibits gluten development: When gluten in flour tries to form, sugar can prevent it from happening. Gluten makes many baked goods tough and unpalatable, and sugar ensures the product remains tender, without tough gluten fibers. Crisps pastries: Again, sugar works as a caramelizing agent by providing that quintessential crunch to many baked goods. Many baked goods depend on the crisp texture provided by sugar. After exploring these incredible features of sugar, we began a series of actual demonstrations.Whipping egg whites with and without sugar showed the importance of sugar in forming those peaks. Sugar was heated to different points and then cooled to demonstrate how the properties of sugar changes at unique temperatures. At different temperatures, the sugar changes significantly as it could become a hard ball of sugar or a smooth caramel. As the pièce de résistance, Chang created a magnificent croquembouche with heated sugar, which melted to form a net of spun sugar. The thin, angelic threads of sugar demonstrate the truly impressive properties of such a simple substance. In addition to this extravagant experimentation with sugar, Chang has most recently written a cookbook, Baking with Less Sugar. This feat is incredible given the properties that were explored in the lecture. Chang explored a wide array of natural sweets as possible sugar substitutes and how to get the most out natural sweetness. Be sure to check it out! Shopping week is often a perilous time of year. The night before it begins, you have the perfect plan figured out: 4 (or 5) classes, no Friday sections, and a nice long lunch each afternoon. Then midway through the week, you’re on the phone with your parents telling them you just cannot get it together for this semester. “Mom, I’m just going to dropout.” Classic. Choosing can be tough, which is why the Crimson Crave has put together a list of food-related courses for your shopping list. Tough just got tougher…and chocolatier and cheesier. Check out the lists below for courses running this spring and fall! cat clock in caddy corner (lifted of some garage sale) watches over kitchen. sandwiches laid out cut like maple leaves. broth homemade, talisman against cold of all sorts. cat clock in caddy corner watches over mouse hours. hollow, with formations of numbered things. and fingers grasp for pallid pastries factory fresh. slurps time until time trickles down corners of mouths. Here is cold of all sorts. Missed cooking sounds: Crunchy heads of broccoli. Charred meat on outdoorsy dad grill. Knead dough, need dough, kneed dough. Powder puffs of whipped egg peaks. dressed like scholars, consuming canned foodstuff by the forkful. last week’s ravioli, dreams of yesteryear. men, men with beards, buttons, dark historic jackets, watch from walls. if they fall to the ground and no one there to witness, would they make a sound? —call back memory of making something wholly made. listen deep to crackle of grease—breath—and remember love in cooking sounds.